Downtown Indianapolis is a thriving artistic and cultural environment, with plenty to see and do. This area boasts of over 200 shops, more than 250 restaurants and bars, plenty of museums and historic sites - not to mention a myriad of performing arts and theatres, galleries, and other unique attractions. Living in Downtown Indianapolis affords its residents all the best that city life has to offer, along with a broad range of home prices to fit every budget. If you don't live in Downtown Indianapolis, but would like to spend a day, or weekend there, taking in the sites and exploring the metropolitan area, what should you see? What should you do? The answers are endless, as there are hundreds of opportunities for the visitor to Indianapolis. One of the more unique aspects to Downtown Indianapolis is the incredible amount of culture and arts available to partake in. Whatever your passion is, you'll find it! Artistic Spirit Gallery - selling original outsider art (visionary art). Domont Studio Gallery - is dedicated to the works of artist John J Domont, and focus on the Indiana Landscape. With 16 different museums in Downtown - from sports, to fine art, to nursing, Indianapolis has a museum for everyone. Here are a few worth visiting. Indiana War Memorial Museum - contains hundreds of other artifacts, photos, and documents. Indianapolis Museum of Art - founded in 1883, this museum is among the largest and oldest general art museums in the United States. The Children's Museum of Indianapolis - this museum is the largest children's museum in the world...and a lot of fun, too! On the other hand, if your passion is music, Downtown Indianapolis has an amazing variety of possibilities for you to choose from. The following will get you started! Indianapolis Symphony Orchestra - This orchestra is one of America's leading orchestras. New World Youth Orchestra - This group is made up of young musicians who perform contemporary and traditional masterworks. Philharmonic Orchestra of Indianapolis - an incredible orchestra with musicians of all ages, from 4 years old to 80. American Cabaret Theatre - Indianapolis's premier musical theatre. Indiana Repertory Theatre - This theatre is one of the leading regional theatres in the country. Young Actors Theatre - This amazing group is the oldest independent children's theatre in Indianapolis. Broad Ripple Village - with a thriving art scene, plenty of shops, historic buildings, and parks, you'll have a blast roaming the streets of Broad Ripple Village. During the day, you'll find beautiful neighborhoods to stroll through, and at night you'll find plenty of music to sing along to. Fountain Square - with a central fountain reminiscent of a European village, you'll fall in love with this historic neighborhood. This artist's community thrives with a retro and new art flair that is easily recognizable in the architecture you'll see. Mass Ave - with live theater, music, trendy galleries, and many shops and restaurants, you will find plenty to get excited about. Mass Ave is also unique in that you'll find an interesting mix of urban architecture alongside historic neighborhoods. If you truly only have one day to spend in Downtown Indianapolis, you may have a difficult time deciding which venues to visit first. The best suggestion is to consider the weather, your personal likes, and how active of a day you want. 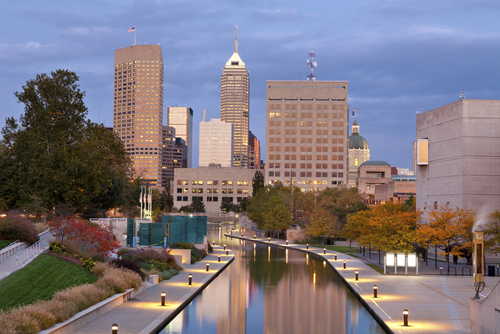 Of course, you can always come back - and with all that Downtown Indianapolis offers, you'll definitely want to!